The Case of the Speluncean Explorers, written in 1949 by Lon Fuller, is the first famous fictitious legal case of all time. Describing a case of trapped travellers who are forcd to cannibalize one of their team, it is used on courses in philosophy of law and Jurisprudence to show how their trial upon rescue touches on key concepts in philosophy and legal theory such as utilitarianism and naturalism. 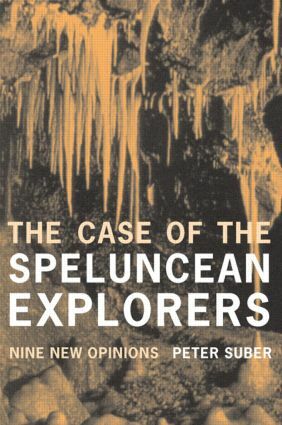 The Case of the Speluncean Explorers: Nine New opinions includes a reprint of Fuller's classic article and a much-needed revision of and addition to the five openings originally expressed in the case by the five Supreme Court Judges. Peter Suber carefully and clearly introduces students to the main themes of Fuller's article before introducing nine new opinions. These opinions include perspectives from communitarian, feminist, multicultural, postmodern and economic theories of law, updating Fuller's original case and bringing contemporary theories of law to bear on the five original opinions. Why read this book? One reason is to get beyond sloganeering about "judicial activism" and "activist judges". The book is an enjoyable and even-handed way to understand what the debate is about. It doesn't tell you what to think, but illustrates the contending positions and lets you think for yourself. It will show you how judges with different moral and political beliefs interpret written law, how they use precedents, how they conceive the proper role of judges, how they conceive the relationship between law and morality, and how they defend their judicial practices against criticism. It anchors all of this in a Supreme Court hearing of a gripping, concrete case on which real people disagree. (Challenge: Take any view of how judges should interpret law, especially any view that makes it sound easy, and try it out on this case. How well can it respect the facts and law? How well can it answer the objections from judges who take other views? How well does it deliver justice?) The book uses no jargon and assumes no prior knowledge of law or legal philosophy.